Escape to the magical land of Holiday World & Splashin' Safari in Santa Claus, Indiana. This family-friendly destination has a long history of entertaining park visitors. Not surprisingly, the spirit of the holidays is never out of season at this great family destination. Holiday World & Splashin' Safari is a family theme park and waterpark combo located in Santa Claus, Indiana. The park opened in 1946 as Santa Claus Land, becoming the first theme park in the United States. When the park opened, it focused on Christmas and featured rides and attractions for young children. 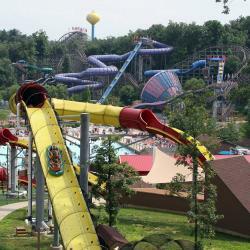 In the 1980s, the park changed its name to Holiday World and expanded to include adult attractions, the Frightful Falls flume ride and a small roller coaster, as well as small waterslides and a water play area. In 1993, the park established Splashin' Safari and added more amusements. The addition of The Raven wooden roller coaster put Holiday World on the map in 1995, during the park's 50th season. The Legend and The Voyage roller coasters were added in 2000 and 2006, respectively. Today, Holiday World Holiday World & Splashin' Safari features entertainment for all ages, making it a fun-filled family destination. The theme park celebrates Christmas, Halloween, Thanksgiving and the 4th of July with rides, live entertainment, games and attractions. 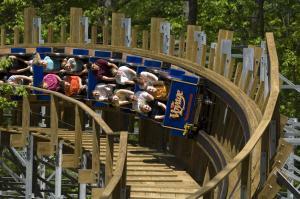 In 2013, TIME magazine named Holiday World's Voyage the nation's #1 wooden roller coaster. Splashin' Safari, named the Best Waterpark in the nation by USA Today, includes the two longest water coasters in the world, numerous family raft slides and water slides, two wave pools, plus water activities for children. Both parks offer guests free soft drinks, free parking, free inner tube usage, free sunscreen and free Wi-Fi. This award-winning family owned theme park offers a wide variety of traditional amusement rides, roller coasters, and water rides to keep every guest well entertained. Thunderbird: Launching on April 1, 2015, this thrill ride is the first launched wing coaster in the U.S. It will feature a zero-to-60 miles-per-hour launch in 3.5 seconds, followed by multiple thrilling inversions. This coaster will start out by soaring and looping high in the air and then hugging the ground. Thrill seekers will delight in the several intentional "near misses" throughout the exciting ride. Mammoth: As the longest water coaster on the planet, Mammoth stands seven stories tall. It's not just height that gives this water coaster its name - it also spreads out over more than three acres. The ride starts with a conveyor ride to the top, which is where the excitement begins. Thrill seeking riders will delight as they speed through breathtaking drops and hills. Wildebeest: This exciting water coaster is only a third of a mile long and the ride lasts for less than three minutes, but it's bound to be loved by anyone who enjoys thrilling water ride. You'll enjoy zipping up the ride's hills, going down as it drops and maneuvering through its twists and turns. There are good reasons this ride has been voted it the #1 Water Park Ride on the Planet by Amusement Today magazine readers for multiple years! The Voyage: This is no ordinary wooden coaster, which is why TIME magazine named it the best wooden coaster in the United States. Riders will love experiencing the 24.3 seconds of zero-G (one of the steepest drops on any wooden coaster) during the 1.2 mile long voyage with 90 degree banking at high speed. Hold on for the ride of your life! The Raven: Rated a top roller coaster ride by Amusement Today and Inside Track magazines, this ride is based on the famous Edgar Allen Poe poem, and offers thrills that include 85-foot and 61-foot drops, sharp turns, and a 120 foot tunnel. The Legend: Rated one of the top ten wooden roller coasters and a recipient of the Amusement Today Golden Ticket award, this exciting coaster is based on The Legend of Sleepy Hollow. Check out the thrilling tunnels, a 77 foot spiral drop, double helix and maximum speed of 65 miles per hour. ZOOMbabwe: Splashin' Safari's main feature is also the largest enclosed water slide in the world, at 10 stories tall. Bakuli: This water slide at Splashin' Safari sends riders swirling down a giant bowl from seven stories up before it drops them down a very long tunnel. Turkey Whirl: This tilt-a-whirl provides plenty of Thanksgiving-themed thrills. The Howler: A family roller coaster that's the perfect thrill for young riders. The Freedom Train: This is one of the park's attractions from the early days, winding through Mother Goose Land aboard a laid back family train ride. Raging Rapids: Zoom down this river raft ride through an Old West town. HallowSwings: This flying swing ride ensures plenty of high flying fun. 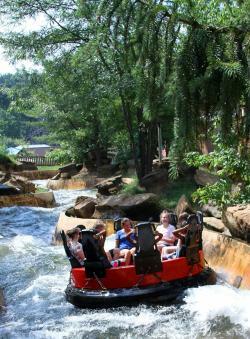 Watubee: Located in Splashin' Safari, this family raft slide is an intense rapids ride. Additionally, guests can ride the waves at two different wave pools, float down lazy Congo River, explore Monsoon Lagoon, ride a seahorse carousel and much more! Guests can check out Dive!, which includes the history of diving from the start of the sport in 1920s to the glory of today's Olympic athletes. This great show is both hilarious and breathtaking. The show concludes with a high diver taking a heart-pounding 80-foot plunge. Musical reviews include 80s Rewind, which features top song and dance hits from the 1980s, Real Country and EPIC Praise, an inspirational, contemporary musical concert. Wildebeestro, Udderly Blue Ice Cream, Kringle's Kafe, Safari Pizza, Jungle Jakes, Plymouth Rock Café and ZOOMbabwe Grille are among the park's many culinary offerings. Guests will never go hungry at the Holiday World & Splashin' Safari with the impressive variety of dining choices. In addition to the fun rides, shows, and great food, Holiday World has loads of freebies for park visitors, including free parking, free sunscreen, and free unlimited soft drinks. Guests can get free iced tea, water, lemonade, carbonated beverages, fruit punch, coffee and Gatorade at Pepsi Oasis self-serve drink areas and dining areas throughout Holiday World and Splashin' Safari. Holiday World is open from late April through October, with ticket pricing that includes both Holiday World theme park and Splashin' Safari waterpark. General admission is $44.99, while guests under 54 inches or seniors over age 65 pay $36.99. Children ages two and under get in free. If you purchase online, you can get discounted tickets for $39.99. Two day tickets and Next Day tickets are available. Season passes and group rates, as well as any special promotions can be found online at the park's website. For more information about Holiday World Indiana, voted the World's Friendliest Park, interested individuals can visit the official website at HolidayWorld.com or call toll free at 1-877-GO-FAMILY.